Exposing my children to a foreign language is something that has always been important me. But since I am not fluent in another language, I had no idea how I was going to accomplish this. Like most, I took a few years of Spanish in high school, but that doesn’t mean I can speak it! I can read Spanish and figure out what it means, but listening for comprehension or speaking it, I cannot do very well. Since we live in Texas, it is becoming increasingly more important for everyone to be able to communicate in Spanish. So, I was thrilled whenever I came across Little Pim, and even more thrilled when they asked me to review it! Little Pim believes that all children deserve to learn a second language. Winner of 25 awards, their programs make learning a foreign language easy and accessible to all kids- at the age they learn best, from 0 to 6 years. Their videos, books, flashcards, and CDs keep kids entertained while inspiring in them a lifelong love of language learning. Little Pim offers learning materials in 11 foreign languages, and Corbin and Lynley received a three DVD Spanish set. This set includes videos on eating and drinking, wake up smiling, and playtime. What I love about this set is that each DVD contains seven episodes broken into five-minute intervals to keep children engaged. There is also no need for parents to have a background in the foreign language. I did recognize many of the vocabulary words, but Little Pim makes the new words easy to comprehend by saying the word combined with displaying pictures and video of the object. 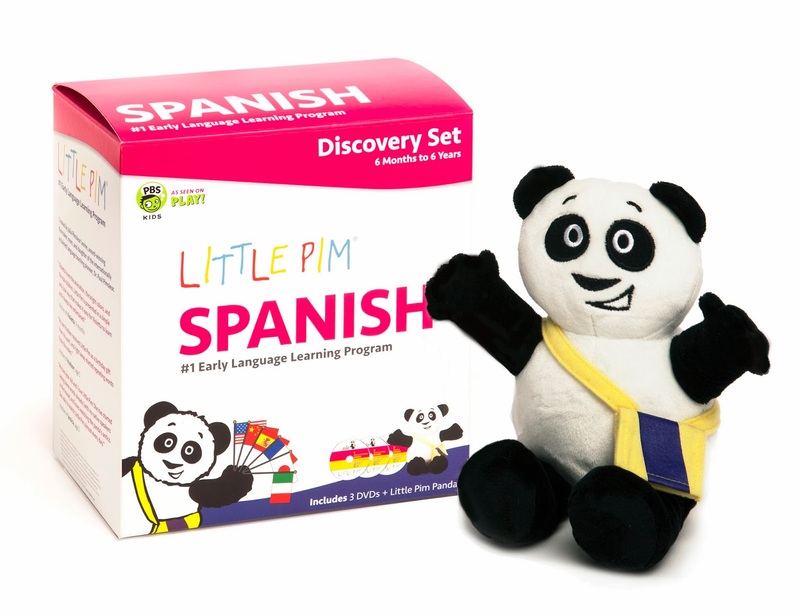 Parents can learn a foreign language right along with their children with Little Pim! Parents can learn a foreign language right along with their children with Little Pim! Click to tweet. Since, we received the DVDs, we’ve watched the first lesson on eating and drinking. This is an area that I am focusing on already. I have tried really engaging Corbin and Lynley at mealtime (it’s the only time they pay attention more than 5 seconds!) by also teaching them sign language. They sign ‘more’ and ‘all done’, and are beginning to say the words of foods. By reviewing the Little Pim eating DVD, I’ve remembered some of the Spanish names for many of their favorite foods! Now, I have begun to say the name of the food in English and then again in Spanish while feeding it to them. It will be a while before they are old enough to recite any vocabulary back to me, but this foundation is going to pay off for them in the future. And, they’ll be able to keep up with their cousins, who have already learned Spanish thanks to their fluent mom! Little Pim would make a great gift for an occasion for the baby, toddler or preschooler in your life, and through January 14th, Spit and Sparkles readers can enjoy 20% off online orders of $45 and free shipping with code: LPHOLIDAY. Little Pim Chinese, French, and Spanish Discovery Sets are also available at Toys R Us stores nationwide. This is not a sponsored post. All opinions are 100 percent my own. I received products free of charge for review purposes. I only recommend and promote products and companies that I believe in. Summer Bucket List- Check, Check! Little Pim is a very good language learning program. I’m being using it for my kids to teach them second language. My both kids likes this program a lot. Thanks for a nice review.